This is sponsored by SanDisk. All opinions are my own. I am not the most technically gifted person. OK, I am pretty bad at tech stuff. I hate to admit it, but I don’t understand the cloud. As in, how and what happens when my phone asks me to use it. At first it was simply an annoyance that I avoided. My phone would ask if I wanted to use it and I would say NO. And then at some point in the history of my phone backups, it just happened…without my knowledge. It was then I went to the store. I figured I needed more information. 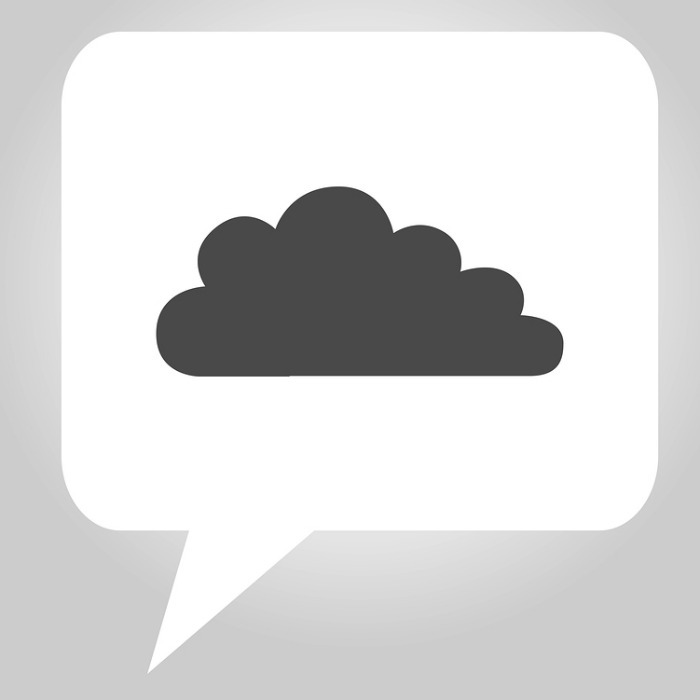 I mean, if I am USING the cloud, I should at least have a little understanding of what that entails. I stepped through the big glass doors. I waited to be greeted. I explained that I needed some information and was told to go stand near a table on the left side of the store about 3 tables in. Is this really a line? And then someone came up to me and told me the time was getting closer and I could go stand next to another table. And then someone came to talk with me. They were probably 12. And although they were very sweet, it was obvious that I WAS SUPPOSED TO ALREADY KNOW HOW TO USE THE CLOUD. It made me feel 85. Like I had rolled my Selectric Typewriter into the store for help. I know that many of you don’t even know what a Selectric Typewriter is which makes me feel 85 again. I chatted with this source of information for a few minutes and left with a bit more information, but what I really want is a backup solution that is easy and LOCAL….not floating around in the atmosphere. 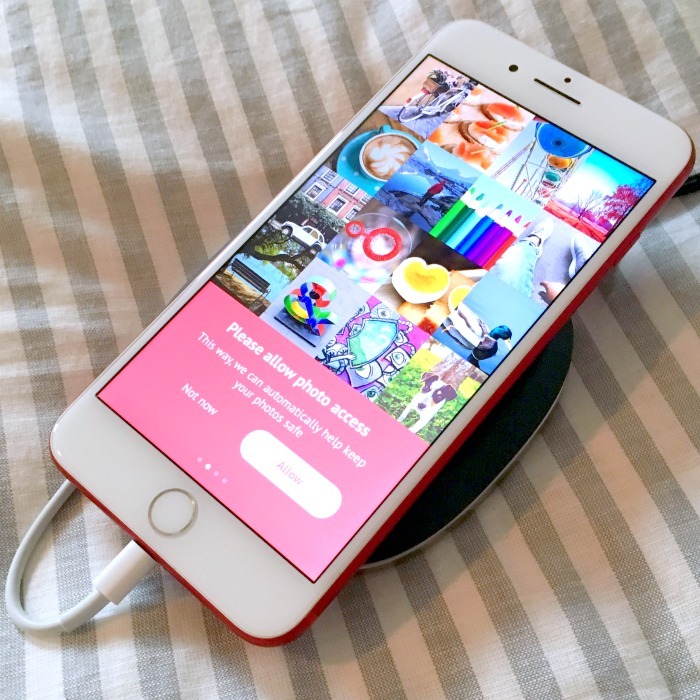 The iXpand Base automatically backs up my photos, videos and contacts every time I charge my phone. The cool thing is that my photos and videos are right on the iXpand Base at original quality with NO RECURRING MONTHLY FEES from the Cloud. How does the SanDisk iXpand Base Work? 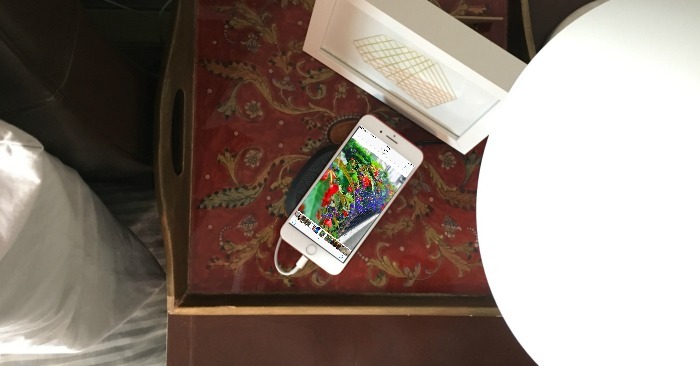 The backup and charge happens via Apple Lightning cable (designed to work with iPhone 5 through 7+. It is a fast-charge with 15 watts of power. I like the soft rubber top which gentle holds my phone without slipping. The iXpand base features a wrap-around groove that keeps cable-clutter to a minimum. I placed it next to my bed and didn’t do anything different than usual. Plugged in my phone to charge. And it backed up my phone while I slept while charging it. You can get one too. Just check it out over at Amazon! This article is sponsored by SanDisk. The backup and charge happen via lightning cable (not included). Subject to device compatibility.